Bacon weave, is it a new hairstyle? 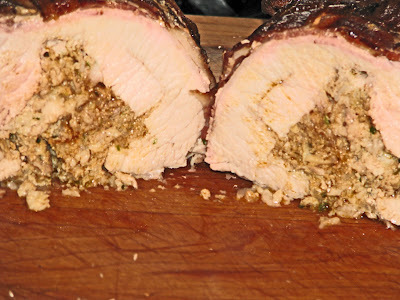 Or is a wonderful crust to a stuffed pork loin. 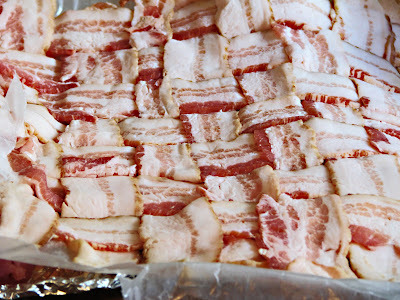 It is the latter and this lattice of bacon will cradle and protect our pork loin roast stuffed with home made sausage. The home made jalapeno sausage was made with some very tasty Mangalista pork fat. All this juicy pork will be cooked in a covered barbeque kettle perfumed with apple wood smoke. This apple wood smoke will be generated by wood that was procured from ‘John’s Wood’. My mouth is watering right now. The first task was to butterfly our pork loin roast with a very sharp knife. The roast was given a couple of whacks with my trusty meat pounder to uniformly flatten this sausage holding vehicle. Some wax paper was put on the cutting board for our pound of bacon to be woven. A simple braid made these rashers into a colorful arrangement. The weave was put into the refrigerator to firm. All that is left is to assemble this meat log of love. The sausage was spread over the flattened roast and rolled up. 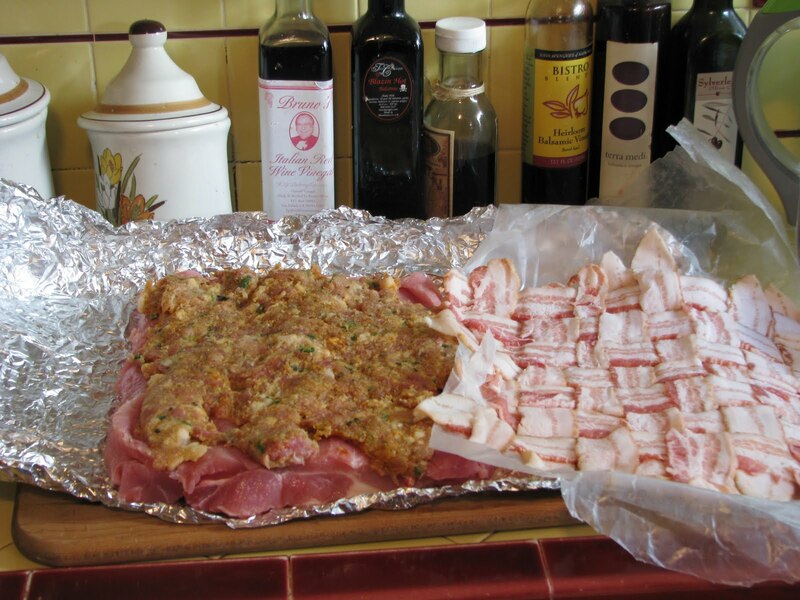 The bacon weave was rolled around the roast and the wax paper was removed. The barbeque kettle was prepared for an indirect fire. Some of our favorite charcoal briquettes were ignited in a chimney starter. Once they were glowing a couple of sticks of apple wood were placed on the fire. 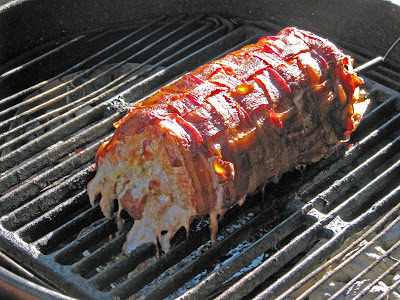 The meat log was gently lowered to the center of the grill and the lid was put into place. All that was left to do was wait for the internal temperature to hit 145 degrees. Once our target temperature was met the roast was removed and covered for a 15 minute rest. Pork, in Pork, on Pork was the ticket today. Juicy and tender with salty bacon and a jalapeno flavored center made for one tasty roast. Apple wood smoke left a subtle kiss of flavor. The bacon weave made for one pretty presentation. This roast was a Mad Meat Genius creation that will go down in our history book of flavor. Wow! That is a Chilebrown classic! That basket weaving class paid off ;) The pork looks killer! I see you have put retirement time to good use. Zoomie, It sure was tasty and thanks. Greg, I am not officialy retired, but so very close. It is beautiful! Really nicely done, lanyard boy. cookiecrumb, This will go nice with my new bow tie.